I read the "short version" of Mark Lewisohn's Beatles' biography Tune In: All those Years Ago (volume 1) when it was first published. I didn't review it because what could I say that was different from everyone else? At that time the Expanded Edition was not available in the United States, but now it is. So I worked hard to save up Amazon gift cards and take online surveys so that I could purchase the Expanded Edition of the book. It has been my goal to read the entire thing over the summer. If you don't have the Expanded Edition, then let me first tell you how it is set up so that you understand what I am reviewing. Tune In Expanded is broken up into two different books and are housed in a slipcase. So while the two books are one book, they physically are broken up into two books: a grey book and a red book. I have just finished the first book -- the grey one. That is what I am going to review today. Tune In Expanded Book 1 starts with the genealogy of the Beatles. Fans of genealogy will be fascinated with this. It is amazing how many children the Grandmothers of the Beatles had that did not live. These women spent most of their lives pregnant. Thankfully and luckily for us, the children that lived ended up being the parents of the Beatles. There is a lot of great information about Liverpool in the 1940's and 1950's in this book. If you have ever been to Liverpool, you will be familiar with the names of the streets and areas and will have that mental picture if your mind. If you have never been there, Lewisohn paints a good description of the town that you will still be able to picture it. What I really like about this book is that Lewisohn did not rely heavily on other Beatle biographies. It is as if he started at ground zero and worked through the story from newspapers, magazines, and first-person interviews as if these stories had never been told before. Many stories that we have taken as truth were dispelled. The best example of this (a story that is in both the expanded and regular book) is the story of John with his father in Blackpool. The memory John Lennon had of that experience was that he was forced to choose to live with mummy or go to New Zealand with Daddy. It has made for an emotional scene in many movies over the years. Many of us had said, "wow what a big decision for them to make a 5-year-old little boy to make..." And while I have no doubts that is how John remembered it, because a child's memory is often distorted, Lewisohn has discovered that there isn't really any truth and it wasn't nearly as dramatic. How could he know this? He interviewed the only other adult that was there -- Alf Lennon's friend that was going to New Zealand. Why hadn't anyone else spoken to this man? The first book tells of the childhoods and growing up of John, Paul, George, Ringo as well as what was happening with Brian and George Martin during those same years. Reading about the formative years in dept really helps you understand some of the quirks and characteristics of the guys in years to come. 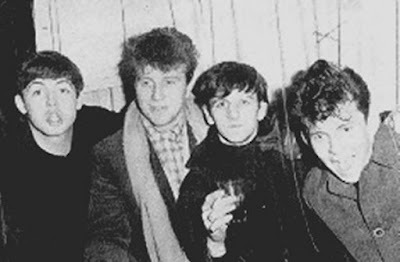 The story of the Quarrymen, John and Paul meeting, George joining, The Johnny Gentle tour and the first trip to Hamburg are all included in great detail. Something new I learned was that the Beatles recorded "In Spite of all the danger" at the little studio in Liverpool. We know this because it is on the Anthology. But they also recorded at the same little studio "One after 909." That whereabouts of that record is unknown. What a treasure that would be! The grey book ends in December of 1960 with the guys back from Hamburg, except for Stu. Our heroes seem to be down on their luck, but I know that in the red book, things will start to work in their favor. This book is HUGE and you can't just sit down and read it. It takes time to digest everything. However, if you love the Beatles, then it is well worth your time and money to do just that. Look forward to my review of the red book whenever I finish reading it. Who knows how long it will take. Thank-you for the review. I've digested the 'short' version and was wondering if saving up for the extended was something to add to my Christmas wish list(perhaps be really nice to the kids and hubby at birthdays and mothers day!) or to just put it in the 'too bad your broke/ don't bother' pile. I will continue wishing and saving and hopeful I will have my hands on the extended version sooner rather than later! I started asking my family for Amazon gift cards for holidays and then I saved them up to buy the book. I also did online surveys, which was tedious but I ended up making $75 from them in an amazon gift card. It was a lot of saving to get it, but worth it! Totally worth it. I always say that the extended version is the real version, the whole picture is there.